Embroidery is a beautiful way to embellish apparel. Almost all fabric and clothing can be embroidered upon. Personalize your Aprons, Towels, Blankets, Clothing, etc. with names, monograms or your business logo. 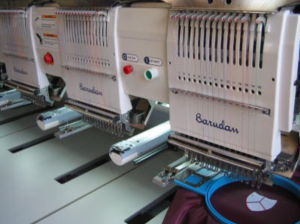 We can transform your logo into a readable file to embroider onto all your garment needs. 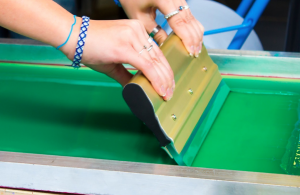 Silk Screening is the process of decorating by means of pushing ink with a squeegee through a screen to transfer ink onto a substrate. T-Shirts, Sweatshirts, pants and shorts are the most common, but many other items can be silk screened, and we do it all right here.